Though the Motor Vehicles Act stipulates that no more than three adults should travel in an autorickshaw, the authorities can permit up to six children. 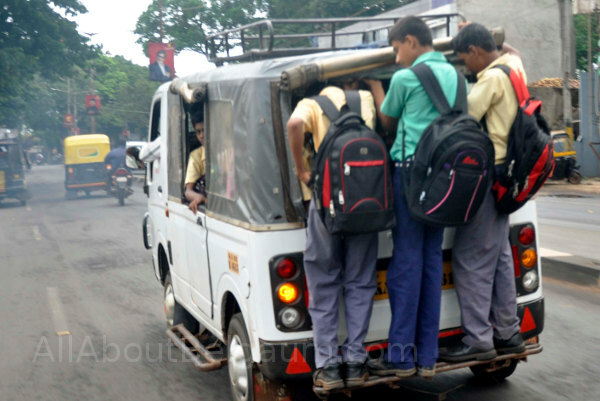 However, most autorickshaws/vans brazenly violate the rules and pack children in their vehicles as if no ceiling exists on the number of passengers. It is common to see autos packed with 10 and sometimes 12 children precariously hanging onto whatever little space is available in the vehicle, which is already stuffed with their school bags and tiffins. On the other side, if the numbers are reduced, parents will have to shell out more money, the parents speculate.